Published Mar 23, 2016 by Addison-Wesley Professional. Part of the LiveLessons series. Core Java® has long been recognized as the leading, no-nonsense tutorial and reference for experienced programmers who want to write robust Java code for real-world applications. 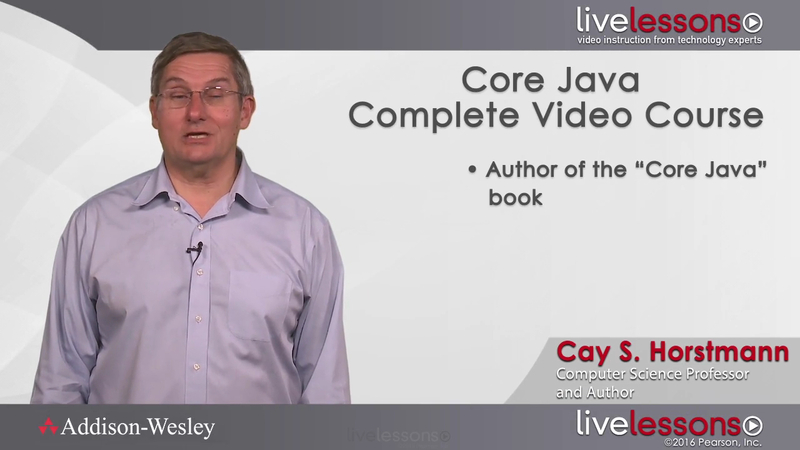 In Core Java® LiveLessons, Cay S. Horstmann takes that same approach to introducing experienced programmers to Java, with detailed demonstration. This training pairs with the recently released tenth edition of Core Java®, Volume I—Fundamentals, which has been fully updated to cover Java SE 8. The first two lessons of Core Java® LiveLessons quickly review the history of Java and show you, step by step, how to install the software development environment. In lesson 3, you will learn how to do in Java what you already know in another programming language: write branches and loops, and work with numbers, strings, and arrays. Cay S. Horstmann is a professor of computer science at San Jose State University and a Java Champion. He is also the author of Core Java®, Volume I—Fundamentals, Tenth Edition (Prentice Hall, 2016), Core Java® for the Impatient (Addison-Wesley, 2015), Java SE 8 for the Really Impatient (Addison-Wesley, 2014), and Scala for the Impatient (Addison-Wesley, 2012). He has written more than a dozen other books for professional programmers and computer science students.